Dabee Road Nursery located on the edge of Kandos outside an old rustic tin shed and on first sight contains a varied array of farm machinery which could or maybe hold the key to culturally significant agriculture history and or / an OH & S disaster but ideally situated for ‘Blood on Silk price taker, price maker’ by Fiona Davies. 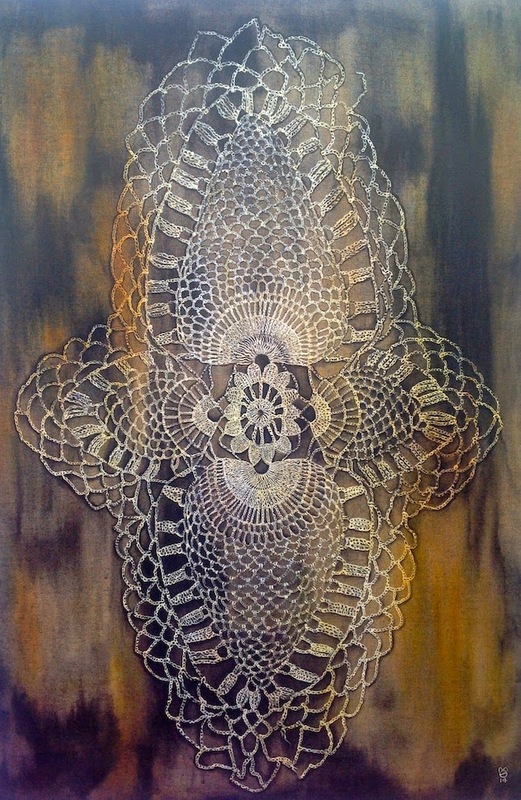 This work explores the continuation of the Blood work that we have all grown to appreciate and expect. A wall of polystyrene boxes containing what we think is Blood for sale, slotted into the front of boxes are some monitors showing blood types and ICU readings and a catalogue of labeling. The market caller was given a small script as Fiona says but has added brilliant ablibing to make it all the more real. Thankfully there is no physical evidence of the sacret red stuff for this squirmish reviewer but the idea was confronting as it created the scary illusion of Blood sold on the Black Market. Out through the somewhat exotic or ideal indoor/outdoor plants for sale nursery and around the corner to the other side of this rustic shed lies the work of Hill End artist Genevieve Carroll. ‘We Just Want to Throw Flowers At The World’ boldly proclaimed from high up on the front of the shed. It’s pink frontage with red shadowing set against the weathered exterior summons rose petals to soften the constant depressing blows from the daily onslaught of reported bad news. Meaghan Shelton won first place in the Portraiture category of the Kenilworth Trophy Art Prize last year, and exhibits throughout Australia. Shortlisted for the ANL Prize in Victoria as well as the Clayton Utz Prize, in Queensland. 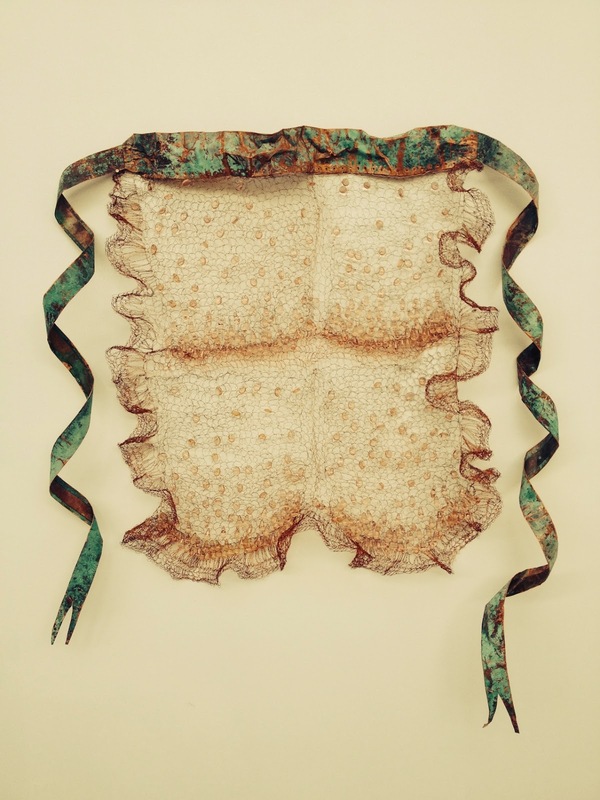 Also a graduate of RMIT majoring in painting, and now works from her Imbil studio and is the newest committee member of Mary Valley Arts Link, the cultural group which coordinates the artspace at Kandanga Country Club, and will curate a program of on-going exhibitions at the club. The two piece cigar box blues arrangement Eb n Flo created the perfect backdrop for the opening which was on Friday 17th April. A two-pronged move by Mary Valley Arts Link - to make art accessible to the general public and to promote the works of its member artists. The renovated club provided the perfect backdrop to the original artworks and offered a professional hanging system to make it a great local exhibition space. Yet again the Lovett Gallery is showing a fascinating exhibition. Appealing to children on an illustration and story book level is a phenomenon this gallery has achieved before. But the artistic integrity of the works on display makes the exhibition a very worthy addition for the gallery wanderers out there. There is much variation in the realm of book illustration which is a lovely way to expose children to artistic difference. In this exhibition titled “ANZAC Illustrated” the assortment is outstanding demonstrating the diversity and integrity of art that children’s picture books reveal. Craig Smith is a much loved illustrator whose pictures are fun with their comic roundness. Smith’s illustrations are the accompaniment for “I was only 19” by Redgum’s John Schumann which is an apt combination of talent. And what a wonderful way to introduce children to these mesmerising lyrics that although not strictly ANZAC, are a powerful testimony to youth and its defencelessness when it comes up against the commanding doctrines of the state. The working drawings and research behind the scenes is an important part of this exhibition. Being able to flick through a portfolio displaying rough drawings, snippets from newspapers and magazines and brief notes is an example of the depth required to comprehend and effectively communicate pictured responses to a scribe. 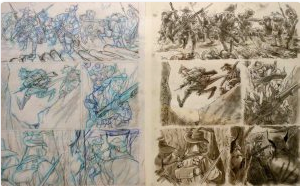 The working drawings by the artist Greg Holfeld for ANZAC Tale by Ruth Starke show how the pictures are worked up into the final stage drawing. 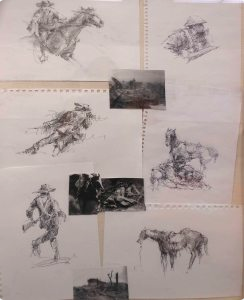 But the highlight for me was the ink and pencil drawings by Brian Simmonds for the book Light Horse Boy by Dianne Wolfer. Quick yet with precise tone and contour these little sketches demonstrate the skill required to illustrate. Another favourite for its atmosphere and enigma was The Poppy by writer and illustrator Andrew Plant. A verdant valley warm and welcoming is shrouded by a menacing sky while a single poppy petal floats in the manipulative dance that is fate. Certainly this picture says it all. ANZAC Illustrated is a beautiful exhibition for children and indeed adults. It’s pertinent and sad but also reflects the wonderful attributes of artist as illustrator. At Lovett Gallery above Newcastle Library until 2nd May 2015.